Turkish Chief of Staff General Hulusi Akar, left, Somali prime minister Hassan Ali Khayre, center, and Turkish Ambassador to Somalia Olgan Bekar cut a ribbon to open the Turkey-Somali military training center in Mogadishu, Sept. 30, 2017. 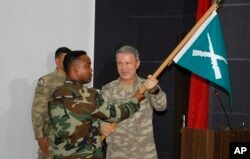 Turkish Chief of Staff General Hulusi Akar, right, hands a flag to a Somali soldier at the new Turkey-Somali military training center in Mogadishu, Sept. 30, 2017. 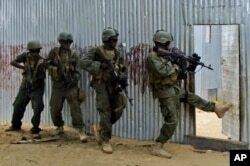 FILE - Somali soldiers search through homes for al-Shabaab fighters, during an operation in Ealsha Biyaha, Somalia, June, 2, 2012.